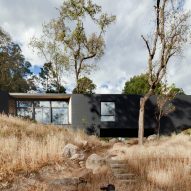 Architecture firm Cadaval & Solà-Morales has used fallen and dead trees found around this house in Mexico to imprint its concrete exterior, which is painted black to help disguise it amongst the forest. The 300-square-metre Casa de la Roca is located in wooded mountains near to Valle de Bravo – a lakeside town to the west of Mexico City. 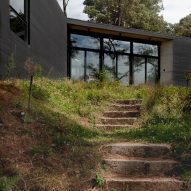 Comprising three volumes laid out to resemble a Y-shape, the residence is built primarily from concrete, which Cadaval & Solà-Morales chose because it has the best structural properties to bridge the slope of the site. The firm gave extra texture to the material by imprinting it with the wood sourced from the remnants of trees in the surrounding area. 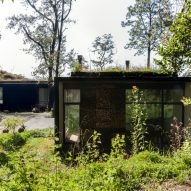 The walls are painted black on the outside to lessen the building's visual impact on the surroundings, and to protect the concrete so that it weathers well over time and requires little maintenance. 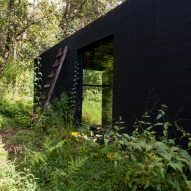 "It is [painted] black, responding to the desire to blend in with the landscape, seeking a certain anonymity in front of the vegetation and exuberant views," said Cadaval & Solà-Morales – who also painted the exterior of a concrete retreat in the Mexican countryside black – in a statement. Upcycled wood also forms the roof structure, which is topped with shrubbery to further match the green landscape. Meanwhile, the ceiling beams are left exposed inside. Cadaval & Solà-Morales designed the house with three arms to point towards different views. 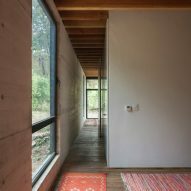 Large windows are placed at each end with the walls extending slightly to create covered outdoor decks. An open-air covered lounge and dining area occupies the middle of the one-storey property, where the three arms meet. It leads straight from the front of the residence to a deck overlooking a lake at the rear. Here, residents can relax on extra chairs around tables, or in a hammock. 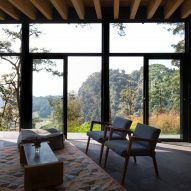 "The landscape surrounding the house is a unique place, where each and every one of its corners can be celebrated," said the firm. "The project works with a double strategy: to build lookouts towards three specific points distant from each other, while building a central, nodal, protected but open to the outside, and that has a total exposure to different environments that the own architecture delimits." The central space also splits the property into two distinct areas. One wing is occupied by two bedrooms that open onto a terrace. On the other side, the remaining two blocks join together to form an open-plan living, kitchen and dining room, and an additional lounge. Another three bedrooms are located at the far end of these volumes to make the most of the privacy and views. Sliding floor-to-ceiling windows are placed along the walls to allow cross-ventilation, aiding a natural heating and cooling strategy, while a series of roof openings offer more natural light. The thermal mass of the concrete also helps to regulate the temperature. Inside, the exposed concrete walls and wooden ceiling beams are complemented by large grey stone tiles. These run from the outdoor living area into the open-plan space, while black frames around the windows match the exterior. In the living room, wooden chairs pick up on the tones of the beams and the sandy ground outside, with a black wood burner hanging from the ceiling. Monochrome finishes feature in the kitchen, including white cabinetry and grey stone countertops. Grey tiles transition to wooden boards for the floors of the bedrooms. 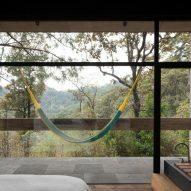 The master suite is located in the south-facing end, featuring a bathtub sunken into wooden slats, and a colourful hammock hanging in the terrace. 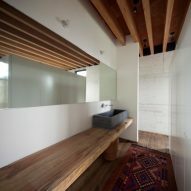 Another bedroom leads onto a patio that also forms a store for fire wood. Cadaval & Solà-Morales was founded by Eduardo Cadaval and Clara Solà-Morales in 2003. The firm has offices in Mexico, where it has also transformed an abandoned building into apartments and offices, and Spain, where its projects include a house comprised of ten cubes that point in different directions. Project architect: Eduardo Cadaval & Clara Solà-Morales.